Call me crazy but I have 4 rain barrels around my house. Here is why: rain water is soft and always warm (during the gardening season). Every plant that I have ever known loves soft, warm water vs. the hard, cold stuff that usually comes from the faucet. 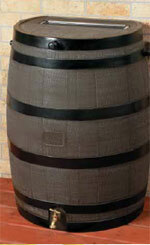 Rain barrels are handy when watering container plants, often less trouble than getting out the garden hose. The Mark’s Choice rain barrel has a flat back to maximize the capacity (which is 42 gallons), it is made of high impact plastic, has a solid brass faucet, a well-fitted, rust-free mosquito screen and it is built to last for a long time. And it is built right here in Canada.